How does religious healing work, if indeed it does? In this study of the contemporary North American movement known as the Catholic Charismatic Renewal, Thomas Csordas investigates the healing practices of a modern religious movement to provide a rich cultural analysis of the healing experience. This is not only a book about healing, however, but also one about the nature of self and self- transformation. Blending ethnographic data and detailed case studies, Csordas examines processes of sensory imagery, performative utterance, orientation, and embodiment. 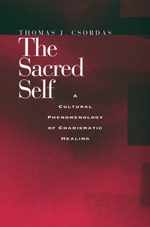 His book forms the basis for a rapprochement between phenomenology and semiotics in culture theory that will interest anthropologists, philosophers, psychologists, physicians, and students of comparative religion and healing. Thomas J. Csordas is Professor of Anthropology at Case Western Reserve University.